The Patron Saint of our parish church is St Edmund, King and Martyr who was King of East Anglia during the time of the Danish invasions of the late first millennium. His legend relates that he was captured by the Danes who gave him the ultimatum of surrendering his Christian faith – and his kingdom – or death. He refused and was tied to a tree and killed by having arrows fired at him until, as his biographer put it, he looked like a porcupine covered in quills. His head was chopped off and thrown into a nearby wood, presumably in an att empt to prevent Christian burial. When his friends came to retrieve his remains, the legend tells that they heard a voice calling out “Here, here” and eventually found a wolf guarding Edmund’s head. His remains were eventually interred at Bury St Edmund’s where a shrine existed for many years. Within a few years, his former enemies were venerating him as a saint and – until St George was introduced by returning crusaders – he was effectively the English Patron saint. Although the details of his martyrdom may be simply legend, Edmund is mentioned in the Anglo Saxon Chronicle as having been killed by the Danes. Because of the story, his symbol is a crown with arrows through it. In the St Edmund’s window, behind the Rector’s chair, the wolf is also featured. Built in 1087AD as a chapel for the nearby manor house, St Edmund’s will be 1000 years old by the end of this century. The original church building is the present nave. About 200 years later an extension – now the chancel – was built. Around the close of the 14th Century, a chantry chapel was constructed on the north wall of the church. This was demolished in the 16th Century, in the time of Henry VIII. The Chantry Certificates record that the priest had closed the chantry without the king’s certificate, presumably to secure any valuables from being seized. The present Chapel of Remembrance was built the same site in 1892, with the organ across the opening. It was used as the vestry. The organ was later moved to the west end of the church. A vestry was built at the west end in 1983 with an organ loft above. At the same time, a kitchen and facilities were built on the north wall adjoining the side chapel. 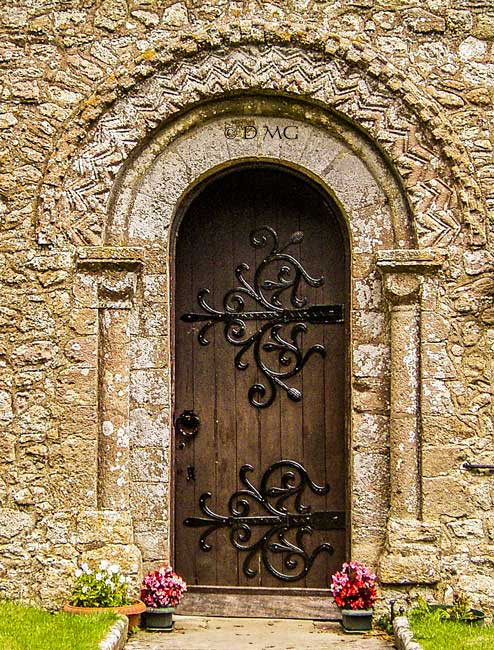 Points of interest are the beautiful Norman doorway said to be equalled only by the doorway in Yaverland church. The font is Jacobean with a Victorian base. The pulpit is also Jacobean. The railings were designed by well-known architect Percy Stone, who did considerable restoration work at St Edmund’s. He also designed our other church of St Mark’s ( see the St Mark’s page for more). 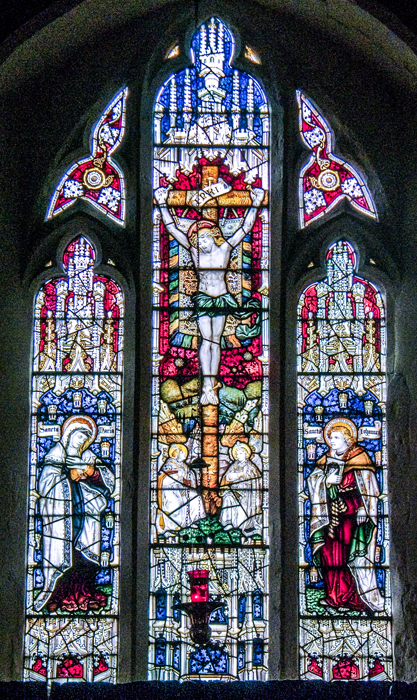 The stained glass is late Victorian. 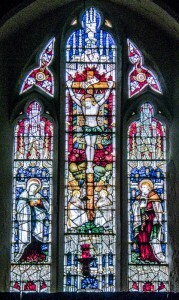 The East window is by the well-known designer Charles Eamer Kempe and is a memorial to Francis White Popham, ( deceased 1894), Lord of the Manor of Shanklin and son of a previous Rector. The history of all the windows was recorded in the Parish Diary kept by the Rector of the time. Also of interest is the blocked up doorway in the North wall of the chancel, which is thought to have been a private entrance for the Lords of the Manor. On the wall of the side chapel is a Royal Coat of arms thought to date from 1813. At the base, though now faded were the names of the churchwardens of the time. 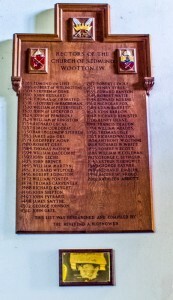 Also in the side chapel is a board with a list of the chantry priests. 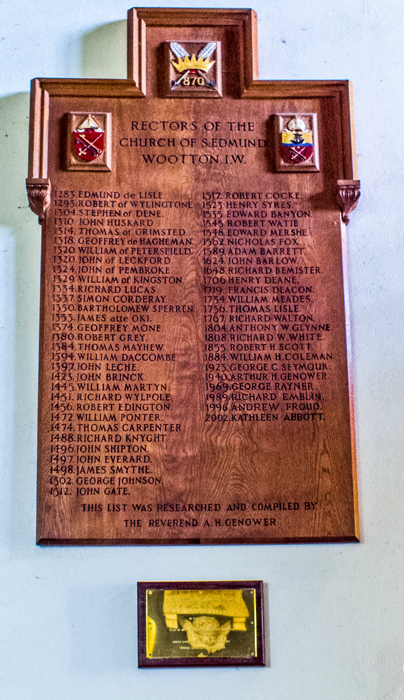 A list of the known Rectors hangs by the main door. Both were researched by the Revd. Genower, our Rector from 1940-1969. Finally on the beam at the entrance to the chancel is a carved figure of Christ, a memorial to a former Reader. The carver was Jack Whitehead, best known for carving ship’s figureheads and for Whitehead Puppets which created the original television puppets such as Muffin the Mule. St Edmund’s is open daily and visitors are welcome.